Medicare is well-known for providing health insurance for people age 65 and older. However, Medicare can also provide health coverage for younger people with disabilities, so if you have a disability, it is important to know how you may qualify for Medicare. The first step is to apply for disability benefits through the Social Security Administration. To qualify for Social Security disability insurance (SSDI) benefits, you must not be working a substantial amount, you must have paid FICA taxes for a long enough period to qualify, and you must have a severe medical condition that prevents you from working and has lasted or is expected to last at least one year, or result in death. If you have not paid enough into the system with your taxes, then you may still be able to apply for Supplemental Security Income (SSI), if you meet the income and asset limits. 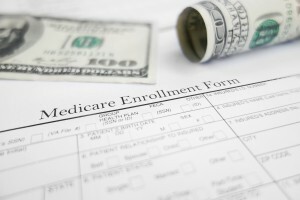 Once you have been entitled to Social Security disability benefits, or Railroad Retirement Board benefits, for 24 months, then you will automatically be enrolled in traditional Medicare (Parts A and B), as opposed to a Medicare Advantage plan (Part C). If you wish to switch to Medicare Advantage, or enroll in Medicare Part D prescription coverage, you may do so during your initial enrollment period, which starts three months before your 25th month of disability and ceases three months after your 25th month of disability. You may also make such changes during the yearly enrollment period, which is from October 15 to December 7 each year. As noted above, after becoming entitled to SSDI benefits, there is a two-year waiting period to become eligible. However, there are two exceptions. People with amyotrophic lateral sclerosis (ALS) can get Medicare when they are entitled to receive disability benefits. For people with end-stage renal disease with kidney failure who require a kidney transplant or ongoing dialysis, Medicare coverage can start three months after your dialysis starts. Posted in New York Special Needs | Comments Off on Can I Qualify for Medicare if I have a Disability?